Art maestro Syed Thajudeen is showing his best artworks of 50 years at the Penang State Museum and Art Gallery until December 31. The colours, culture and constructions of Malaysia is an inspiration for artists’ creativity. 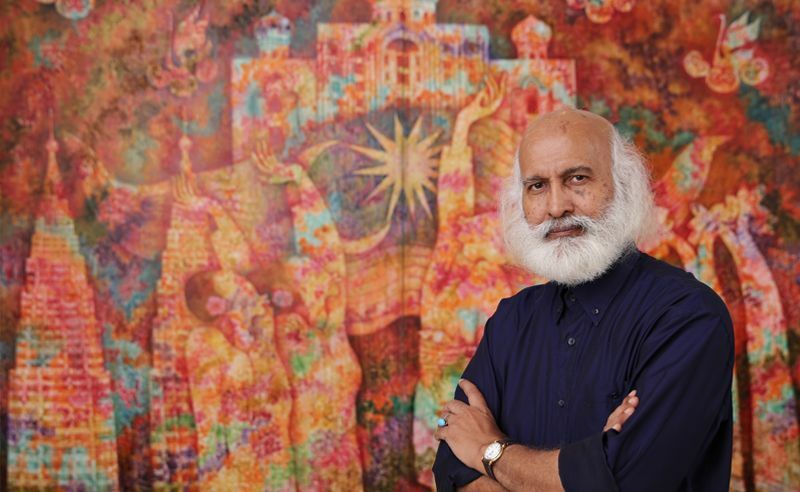 The year was 1975 when one doe-eyed art graduate held his first solo exhibition at the Penang State Museum and Art Gallery and today forty years later, Syed Thajudeen is holding his biggest exhibition at this very place where it all began for him. Restrospective, an exhibition that will narrate his 50 years journey as an artist, is a testimony of Thajudeen’s love for the state of Penang. Highlight of the exhibition is the enormous The Kapitan Kling Mosque painting measuring at 457x244 centimetres as well as monumental paintings that depict local folklore and his famed Kebaya series. With a face blessed with wisdom-ful facial hair, reminiscent of the great Rabindranath Tagore, Thajudeen’s art aptitude is of national treasure proportion. He has magic in his hands and a spellbinding thought process to match. Thajudeen sees the world through rose-coloured glasses, has a natural ability to romanticise his observations and is a master storyteller. “Art has always been of interest and a passion. Since my school days in Penang, in the 50s and 60s, I have been participating in art exhibitions and group shows,” says the 72-year-old art maestro. He was initially sent to India to study medicine but became enthralled with Indian literature, which imbued philosophy and spirituality, during pre-university. “The great epics like Ramayana and Mahabaratha have great universal wisdom that stands the test of time; that greed, arrogance and misuse of power will result in downfall, destruction and disgrace,” he notes. The literature stirred his soul and he enrolled himself into The Government College of Arts and Crafts, a prestigious institution in India. His parents were, naturally, horrified of this sudden turn of event but eventually accepted his education choice. “I strongly believe that art cannot stand alone. The artist must be knowledgeable in literature, philosophy and spirituality in order to create art,” he ruminates. He explored many techniques as a young artist while trying to develop his signature style. He was experimenting with cubism, expressionism and surrealism that were inspired by Paul Klee and the Bauhaus art movement. But it was during a class trip to the Ellora and the Ajanta caves in India that he became enchanted with the Jataka cave paintings. “I tried to simulate the ‘cave effects’ on the canvas by dabbing paint, allowing the oil to stream down to create a faded look. This technique has now become my signature technique. Retrospective at Penang State Museum and Art Gallery will be officially launched on Saturday, November 14 at 4pm by the chief minister of Penang, Lim Guan Eng. Exhibition ends December 31. For more information, call +604-226 1439. Want to know Malaysia’s other great artists? Then art genius Anurendra Jegadeva is definitely worth discovering.